There’s a lot of explaining in Assassin’s Creed. Text is the first thing that hits the screen in the opening crawl, which is worrisome, because director Justin Kurzel (Snowtown, Macbeth) is not known for his taste in fonts. There’s so much exposition, and then I realised: this was going to be the kind of film where they explain the origin of the word ‘assassin’ (they hit it at the halfway mark). Everything, even the title, gets unpacked. There is nothing left to the imagination, which is odd because this is an adaption of the Ubisoft videogame franchise, which is known for giving players a lot of control in various open worlds for flexible play. In a videogame, you get a tutorial that teaches the basics of how the game works. Assassin’s Creed is struck in tutorial mode as it jumps between 15th Century Spain and 2016 where a criminal, Callum Lynch (Michael Fassbender, clean) is forced by the Abstergo corporation to use a machine to access “genetic memories” of his ancestor, Aguilar (Fassbender, dirty). Lynch finds out he’s caught in a battle between two organisations, the Assassins, and the Templars; both with different goals but the same desire to put their logos on everything despite their secrecy. Assassin’s Creed can’t shake the hand holding required to explain the mechanics of the game because it inspires the story. The bridge between gameplay and uncovering how it informs the plot of an adaptation has plagued most game adaptations to date, yet they seem to be vital for some reason. I still have nightmares about the “bring up the grid” scene in Battleship. Book adaptations, for example, mine the source material for the good stuff and are often unafraid to shed what’s unnecessary; sometimes changing the story completely. 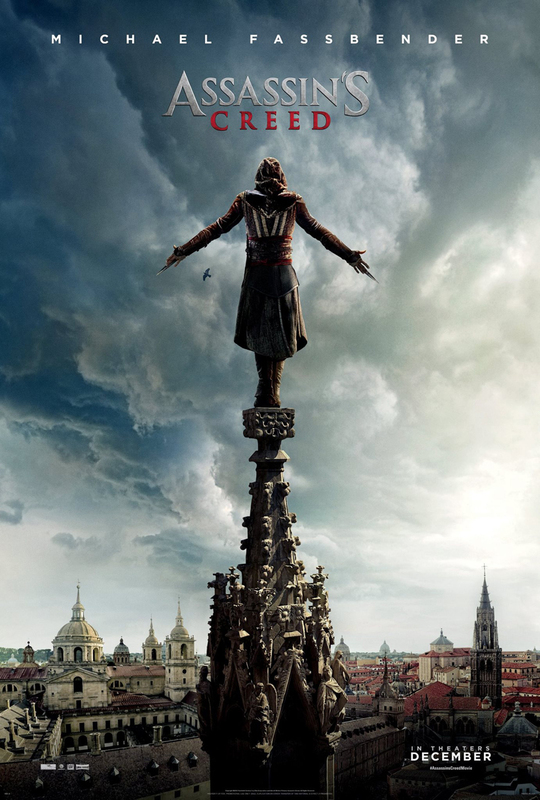 Videogame adaptations are slaves to the material and Assassin’s Creed is no exception. Screenwriters Michael Lesslie, Adam Cooper and Bill Collage try to use the generational gap in the story to examine a genetic disposition to violence, shown mainly between Lynch and his father (Brian Gleeson and Brendan Gleeson), which I imagine is the pitch that got most of the talented cast interested. Whenever this element of Assassin’s Creed pops up it’s cut off by something inane. Marion Cotillard’s character is using “genetic memories” to try to find an item containing the genetic code for free will (stay with me) in hopes it will provide “a cure for violence”. Cotillard, somehow, never makes this sound as silly as when you repeat it back to yourself, but that’s because she’s a great actress, and her job here is to hide how rough this film is on paper; it’s a strategy that nearly works as a grand diversionary tactic for the entire cast. For all the navel gazing about violence, a sub-plot between Cotillard and her father (Jeremy Irons) provides the most dynamic relationship as she does all the work and he takes all the credit. Even the head of the evil Templars (Charlotte Rampling, yes, even she’s in this) gives Cotillard an “I know” look when Irons is bragging about their genetic discoveries. Sheesh, it’s even hard for women to get recognition in shady underground organisations; I wonder what their maternity leave plan is like? Speaking of kids, it’s hard to fathom how any of the assassins from the past managed to become parents to create a lineage when they spend so much time stabbing fast and dying young. It seems like an organisation with terrible succession planning. They do look cool when hopping around ye old Spain in their hoods, when you can see them, that is. Kurzel, and cinematographer, Adam Arkapaw, always have smoke drifting across every scene like their shooting in the middle of Burning Man. Spain is grimy and the smoke is representative of the people burnt alive during the Spanish Inquisition but there’s a point where the aesthetic becomes a distraction. The action always takes the longest route to get to each beat. Four different shots are used to establish a sequence when half the number would have sufficed. During a key chariot chase sequence, Kurzel has the camera fly over the pursuit, then he makes multiple cuts in all different directions before settling on what’s going on inside the carriage. It’s hard to be thrilled when confusion reigns over each action sequence. The greatest trick Assassin’s Creed plays it the frustrating hints it drops at more. You realised they’ve made an expensive prologue. As the camera plans around hooded assassins standing on top of buildings it screams “you ain’t seen nothing yet”, when I felt I hadn’t seen anything at all, and barely enough to motivate any interest in another one. This was a disappointing film, and your final par sums it up perfectly. A sequel will surely depend on the response from China? For sure, or some trashy Euro venture setting it up for DVD sequels for life.